The midterm elections are still three months away and a lot can happen between now and November 6th. But I would propose that there are some themes that have been pretty consistent for a while now, and when it comes to Democrats, show that it is way past time to discard the old narrative about insurgents vs. the establishment. To begin with, Philip Bump joins the bandwagon I’ve been on for a while now and suggests that the coming wave might not be blue so much as pink. 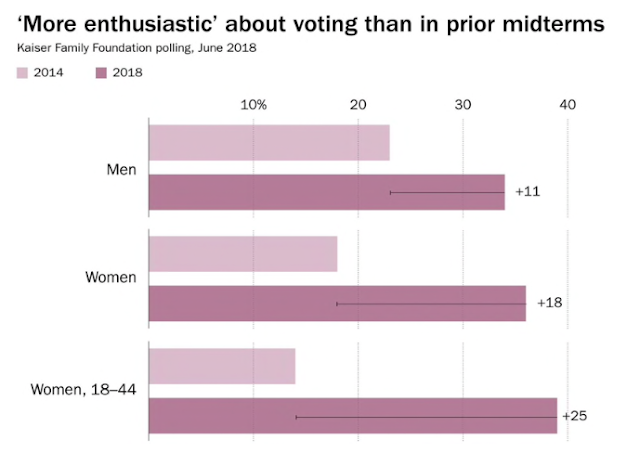 Bump has some great graphs demonstrating things like the record number of Democratic women running in 2018 and the fact that “44 percent of contributions to female Democratic candidates came from women, the highest percentage going to any group since at least 2000.” But given that we know that turnout is key, especially among young voters, this one stands out. 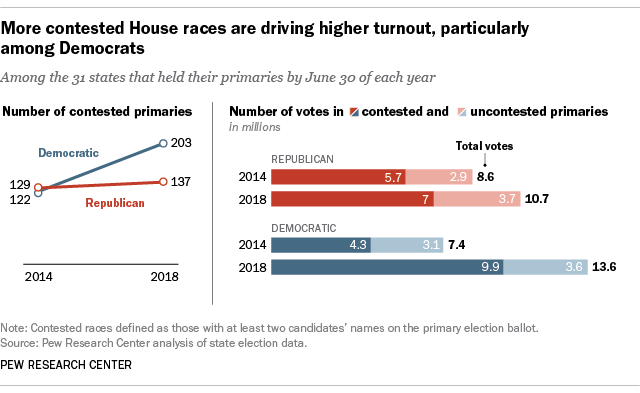 Speaking of turnout, Pew Research has compiled data in the 31 states that have held their primaries. When it comes to issues, Drew Altman finds an interesting result that we’ve been hearing about for a while now. Usually, health care ranks as one of a group of top issues behind the economy and jobs. 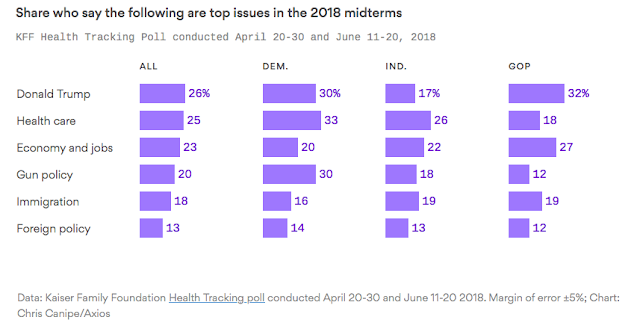 Now, health care is the top issue for Democratic and independent voters for the midterms, and tied for second with immigration for Republican voters. One group we haven’t heard as much about as we head into the midterms is Latino voters. But in a poll of voters in 61 competitive congressional districts, Latino Decisions asked an interesting question related to emotions rather than issues: “Has Donald Trump, because of the kind of person he is or because of something he has done or said, ever made you feel [insert the emotion].” Seventy-two percent said Trump has made them feel angry, an emotion the pollsters suggest is the most powerful for sparking turnout. Take a look at how that breaks down among various Latino groups. The numbers among low propensity voters is significant. 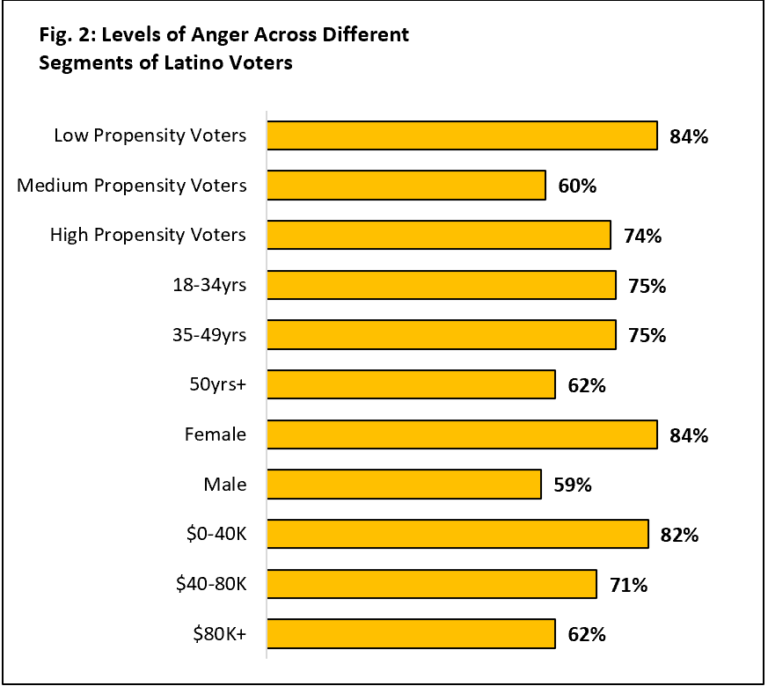 But we can also see that it is not just black and white women who are angry, Latino women are as well. 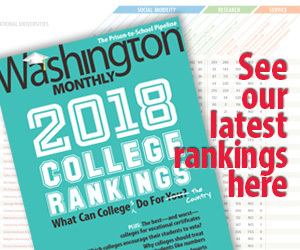 Overall, what we learn is that women are stepping up to the plate in this election like never before, Democratic voter turnout is surpassing what we saw in 2014, healthcare has surpassed the economy as the most important issue for Democrats as well as Independents, and Latinos (especially women) are overwhelmingly angry at the current administration. None of that should come as a surprise to anyone who has been paying attention beyond the so-called “conventional wisdom” narratives. All of those things have been true for a while now, which means that they are likely to still be true on November 6th.